Endorsement by King Zygmunt II August on 4 July 1569 of the Union of the Kingdom of Poland with the Grand Duchy of Lithuania, declared in oath on 1 July 1569, in Lublin. 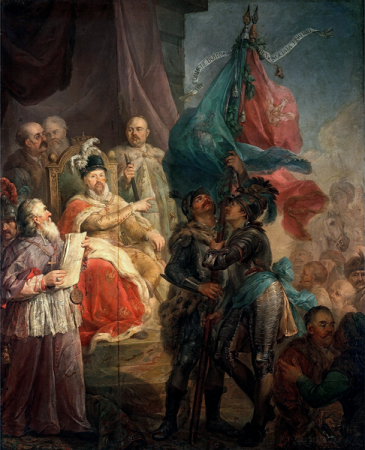 On 4 July 1569 King Zygmunt (Sigismund) II August endorsed with his signature the Union of the Kingdom of Poland with the Grand Duchy of Lithuania, an agreement concluded on 28 June and declared in oath on 1 July 1569 at the Sejm sitting in session in the town of Lublin since 10 January 1569. 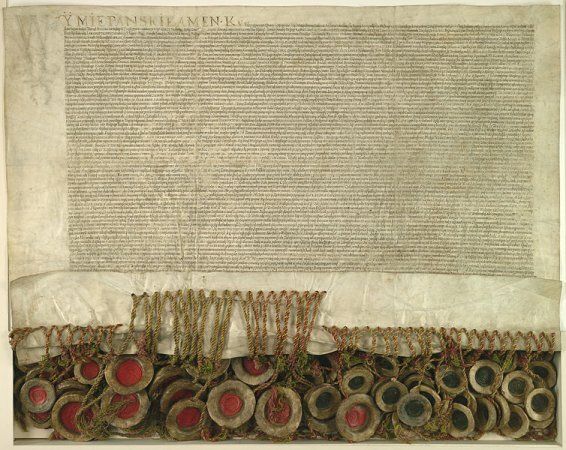 The Act provided for merger of the two states into the Polish-Lithuanian Commonwealth with a commonly elected single sovereign, common Sejm (Diet) and Senate, single coin, common foreign and defense policies. But the Grand Duchy of Lithuania retained its own institutions, including the highest ones, its own army, treasury and judicature. Administrative systems also remained separate. The nobility of both nations was granted the right to settle and own land throughout the Commonwealth.